Well, been a bit of time since I last posted, and there are loads of things I’ve been doing and that I want to talk about. One thing I have heard quite a bit about recently is how kid AVs seem to be excluded from quite a few of the role playing activities in sl, particularly the combat ones. There was even a bit on the Milk and Kookies Show this last week about a combat system that appears to discriminate against kid AVs. What I want to speak about is a role playing sim that includes combat, and that I have been an active part of for quite a time, as a kid AV. 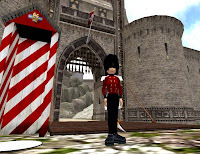 Antiquity is a group of sims that follow a timeline of around the Napoleonic and early Victorian eras. There are pirates, a French group, a contingent of Portuguese, and various others wanting to enjoy that period of history. I belong to a group whose members play mainly British troops of the era, including Guardsmen, Riflemen and Highlanders, along with a very active Navy. When we have fought the other groups, I have been included and accepted by the other groups without reservation, and think that having a youngster involved has given them the opportunity to explore a greater range of role play. Since young people were active in life and combat of the period, as drummers, cabin boys, horse handlers, powder monkeys and in many other roles, we can bring a vibrancy and depth of feeling to places like Antiquity that accept us as we are. I would encourage others to join in with any role play sim, if you are not certain they will welcome you, ask! If they say no, well, ask another, and another, until you find one that says “Well… “, then jump in with both feet and have fun! They will find out how much more fulfilling role play is when it has a full spectrum of aged AVs, and you will have found another place to enjoy yourself in sl. I dunno if you mentioned, or have even been there, but I went to Avilion with a friend. You gotta dress medieval fantasy style. We were roamin' around and someone asked if kids were allowed. Turns out one of their moderators (or whatever you call the rule enforcers) was within hearing range and said kid avatars were totally allowed. We continued roamin' around and explorin'. Hello, I'm in Avilion roleplay since a lot of months. That means, I started with age 8 and now I'm 13, learning to become a healer. I'm an official member of the Avilion Order with the class "Guardian of the mist". Of course I do not take part in battles or deathmatches, as no medieval child would fight in a combat. Avilion, yes,I've been there quite a few times and have always been welcomed, it is a truly beautiful place. It's nice to know they include kid AVs in their roleplay too, though I'm not sure about getting older! Not sure about medieval children not fighting, certainly in battles and sieges, though the ability to handle weapons needing strength would be a factor. Boys were used as Pages and in other non-combat roles, and as in the Battle of Agincourt, the baggage train was attacked, with many Pages dying trying to protect it. But however the role play is designed, it's great to see such a prestigious one allowing us to participate!